Anthony Watts gets over-excited by a meaningless weather (not climate) "award"
This reminds me of Donald Trump, always wanting to magnify his magnificence and making a fool of himself in the process. Anthony Watts is over the moon with excitement that he came top of the class in the weather blog category of some award. The "award" looks to be a way of getting clicks to a content reader/gatherer called Feedspot, which was set up a few years ago - back in 2013 from the look of things. It's weather, not climate, Anthony! Well, I've got news for Anthony Watts. He probably didn't know that Feedspot also has a top 40 global warming and climate change category. That's because WUWT isn't in the top 40. It didn't make the list, as of this writing. The top website in that category is SkepticalScience.com. 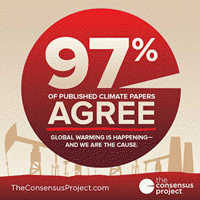 Anthony Watts has kindly pointed out that the scientific consensus on climate change is changing. He wrote the very strange headline: "‘The 97% climate consensus’starts to crumble with 485 new papers in 2017 that question it". Apparently some drongo (who does this every year IIRC) has only managed to dig up 485 "papers" that he claims " in some way questioned the supposed consensus regarding the perils of human CO2 emissions or the efficacy of climate models to predict the future." I expect that, as in past collections, many of findings of those 485 don't dispute climate change, and many probably support the fact that human activity is causing global warming, but I haven't bothered checking (because that's not the point of this little article). What struck me was that 485 was a pretty small number given the vast number of peer-reviewed publications on climate change these days. Now that even beats the 98.4% of WUWT-ers who deny straightforward science. Who'd have thought! Thanks, Anthony Watts, Breitbart, Pierre Gosselin and Kenneth Richard. 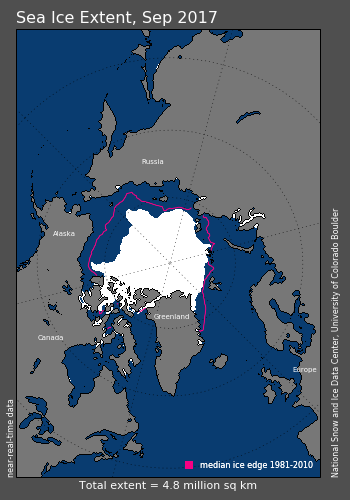 The Sea Ice Index has been updated to Version 3 (V3). The key update in V3 is a change in the method for calculating the numerical monthly averages of sea ice extent and sea ice area data values; that is, the data distributed in .csv and .xlsx format. This change impacts only the monthly data values in the Sea Ice Index time series and not monthly sea ice extent and concentration maps that accompany the data product, that is, the .png, .tif, and shapefile archives. Daily data are also not impacted, nor are any current conclusions drawn from the Sea Ice Index data set about the state of sea ice in either the Arctic or the Antarctic. This change is being made in response to questions raised by users of the product concerning how the monthly average ice extent and areas are calculated. The authors analysed sea surface temperature, the main source of the temperature blips, from a new perspective. 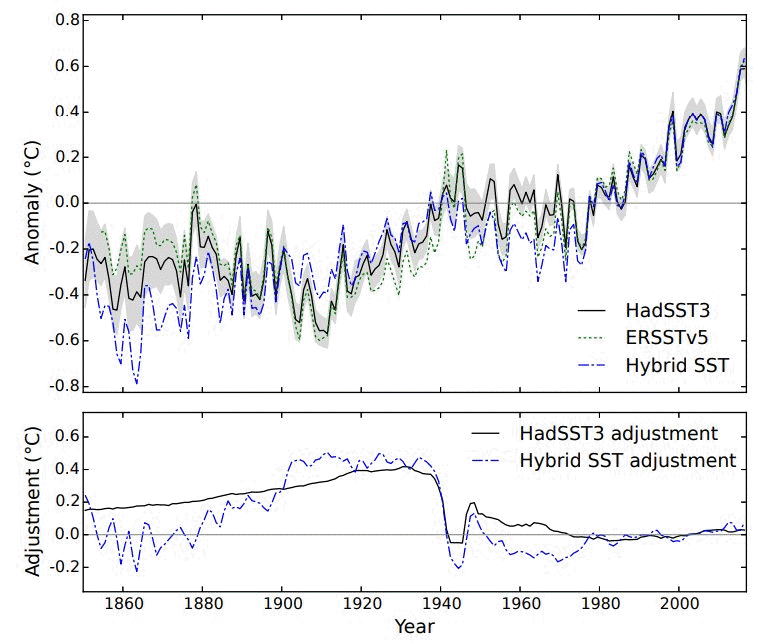 Their analysis can be seen mainly as a check of the bias corrections used in other sea surface temperature records. Instead of reanalysing data from ships and buoys, they compared weather stations on the coast and on islands with the measurements taken on ships when they passed close to the coast. They subjected this to further analysis and called the result a hybrid SST (sea surface temperature). I can only imagine how much work this must have entailed. There are hints in the paper. Not only did they get the temperature records from land and nearby sea, they made adjustments in their analysis to compensate for the fact that with global warming, the land surface is warming faster than the sea surface, plus more. The NOAA sea surface temperature record from 1997 onwards is probably closest to reality. 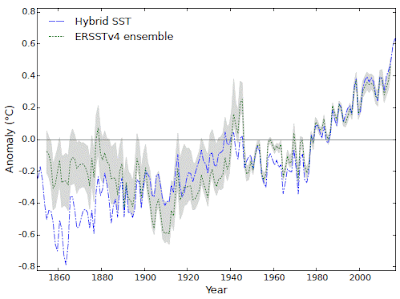 On the other hand, the Cowtan17 analysis indicates ERSST v4 is too warm in the earliest years (1860 to 1900 or so) and too cool in the early 20th century (1910 to late 1930s). 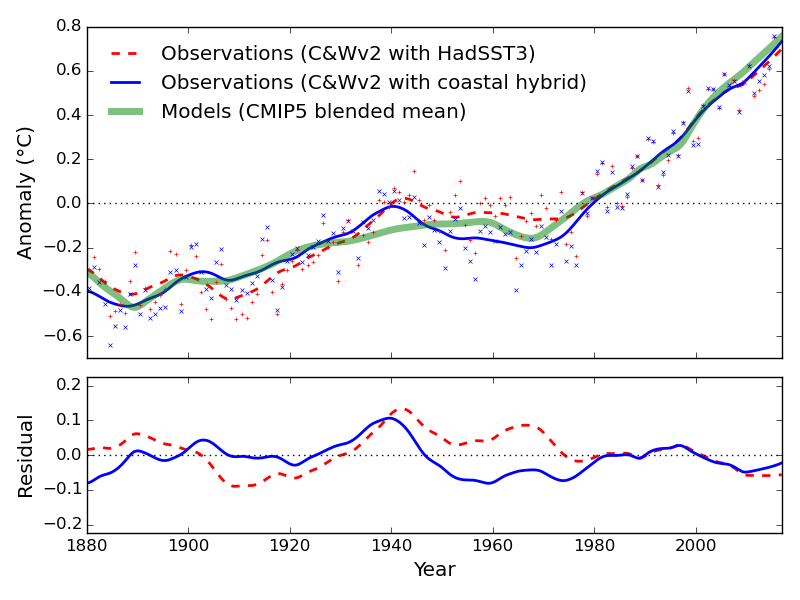 Climate models reflect reality even more closely than previous records suggest. There's an excellent article on Kevin Cowtan's website which explains the research, and accompanying provisos. The paper and supporting information contain a lot more detail, including all the ifs and buts and maybes. 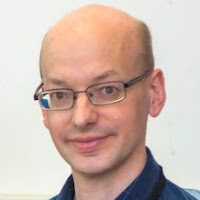 Co-author Zeke Hausfather has a Twitter thread about the paper, too. The authors begin by pointing out that getting a record of sea surface temperature is more challenging in many ways than putting together land temperature records. The difficulty with sea surface temperature is that information sources change much more than those on land. On the land, apart from getting as many records together as possible (thank you CRU and other early collectors, and more recently ISTI), the main issues to contend with are adjusting for changes in instrument design and location. Location changes can be identified from station records or inferred from abrupt changes in the record compared with neighbouring records. Technological change hasn't happened all that often in the past 150 years or so. The main ones include the introduction of the Stevenson screen way back, and the more recent shift to automatic weather stations with resistance probes replacing mercury thermometers. On the sea, the problems include the different sources for temperature readings: buckets of differing materials being dipped into the sea, engine room intakes, sensors on the ships hull and, more recently, drifting buoys and satellites. Within all that, scientists have to account for things like changes in the height of ship decks, interruptions to the consistency of records caused by world wars (where the data source changed from predominately merchant ships to predominately naval vessels), and more. The marvel is that researchers have worked through all these difficulties and developed records of sea surface temperature going back many decades. One period about which most scientists who've worked on the subject have had most issue with are the years of the second world war (WWII). Some data sets show a peak in temperature that has not been easily explained by weather or climate change phenomena. In addition, previous records show a drop in the temperature around 1910 that looks a bit odd. In this paper, the authors did not find the spike that exists in ERSST v5 and to a lesser extend in HadSST3. Neither did they find the drop in temperature in the early 1900s. In the top chart below, the hybrid record is shown in blue. The different series are a bit hard to distinguish so you might want to click on the image to enlarge it. Figure 1 | Comparison of the coastal hybrid temperature reconstruction (using all coastal stations and fitting the global mean of the coastal temperature differences only) to co-located data from HadSST3 and ERSSTv5 for the period 1850-2016. Spatial coverage is that of HadSST3 for all of the records, with coastal cells weighted by ocean fraction.The shaded region is the 95% confidence region for the HadSST3 anomalies including combined bias adjustment and measurement and sampling errors. The lower panel shows the adjustment applied to the raw data in the HadSST3 and coastal hybrid records. A comparison with the ERSSTv4 ensemble is shown in Figure S7. Source: Cowtan 17 Figure 12. To help see the difference, the chart below compares the Cowtan17 hybrid record with NOAA's ERSST v4 record. As discussed, the two are very similar in the most recent decades, but differ much more in the period prior to the early 1940s. The table below highlights further that the Cowtan17 analysis is closer to the NOAA data set for the period after WWII since 1997 than it is to the Hadley record (HadSST3). The trend of HadSST3 is lower than that found in Cowtan17 and ERSST v4. Table 1: Trend in sea surface temperature since 1997. Source: Cowtan17 Supporting Information Table S2. Another thing the analysis suggests is that there is less of a difference between observations and the blended mean from CMIP5 model runs. This is shown in the chart below, from Kevin Cowtan's briefing paper, where the green line is the CMIP5 blended mean. Figure 3 | Comparison of global temperature records based on either the UK Met Office sea surface temperature record (HadSST3), or our coastal hybrid record. 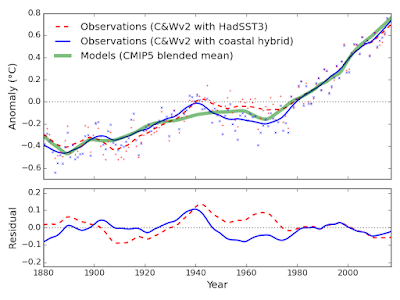 The smoothed records are compared to the average of climate model simulations from the CMIP5 project. The lower panel shows the differences between each set of observations and the models. Source: Kevin Cowtan's blog article. However we do not necessarily trust our new record, because of the assumptions we had to make in constructing it. The most important result of our work may therefore be to identify places where extra attention should be given to addressing problems in the existing sea surface temperature records. A secondary result is that caution is required when trying to draw conclusions about any differences between the models and the observations, whether it be to identify internal cycles of the climate system or problems in the models, because the differences that we do see are mostly within the range of uncertainty of the observations. Just the same, this paper has a lot of merit, looks at the data differently, and shows that the spurious peaks and troughs from years gone by may indeed be out of whack. It also supports the records in recent times, which seems to me to add weight to their findings. Nothing. At least nothing at WUWT or anywhere else that I've seen. Either they all missed the paper because it came out in the holidays, or they haven't figured out what to say about it.